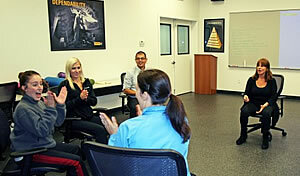 Teams and groups come together for an intensive training in The Kreitzer Method’s high impact communication skills. The power of Penny’s individual skills coaching is combined with peer learning, providing an optimum environment for team building and personal growth. By working with a set of cohorts, individual learning skills are strengthened through peer coaching, and teams naturally build better rapport and trust. This becomes the perfect platform for building sustainability. Each participant is coached in three presentations in this highly active training that sets the stage for communicating vision and strategic thinking as a story. This workshop provides a clear understanding of The Kreitzer Method’s “how to skills” that will radically shift your communication. The skills are: presence, breathing, voice, focus, how to hold space, land very clear intentions, energize language, reduce nerves, being in the moment, thinking on your feet and projecting your voice in a space of any size. These proven skills are empirical and logical. You will also learn a specialized theater technique to connect intention/thoughts to breathing in a way that is always authentic. "During my recent Haas reunion, I attended your seminar on Authentic Leadership Presence and Voice: Connecting Power to Speaking. Within the first five minutes, I understood the school's wisdom in adding you as a professor to focus on these vital communication and leadership skills. I not only learned but experienced first-hand the connection between voice and mindset and how leadership and authenticity are inextricably linked. In little more than an hour, you enabled participants to experience how what they think is linked to how they breathe and ultimately, how their voices are projected with power. You truly taught us how 'to suit the action to the word, the word to the action'. Thank you for a memorable experience and bravo to you and Haas for adding an essential leadership component to the curriculum."